The choir season is during the fall semester. It begins in September and concludes at the end of December. Rehearsals for 3rd grade are after school on Mondays from 3:05-4pm. Rehearsals for 4th grade are Tuesday mornings at 7:30-8:00am. ***3rd graders, please make sure you have a change of dismissal form submitted to the office. If your last name begins with A-L, you will pick up your child in the south carpool lot. If your last name begins with M-Z, you will pick up in the north lot. Choir tracks for the 2018-2019 school year are available below for summer listening and fall practice! 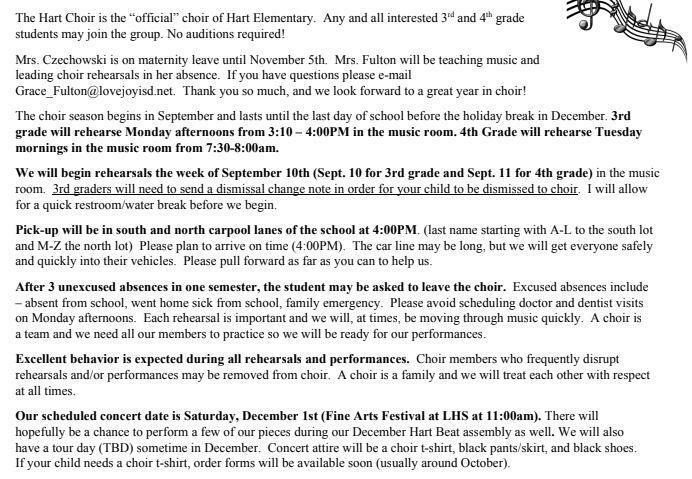 All students are required to have a choir t-shirt to perform for the Fine Arts Festival and participate in the choir tour in December. Choir shirts are the same shirts from last year, so please only order if your child is new to choir or has lost or damaged their shirt from last year. We need to have a count to know how many shirts to order. If your child already has a t-shirt, PLEASE FILL OUT THE FORM ANYWAY. There will be a place for you to indicate that your child does not need a shirt. This will help me to make sure every child is accounted for and has received the t-shirt information. Parents are welcome to order a shirt too (there will be a place for parents to be included on the form).